1:00 PM at the Ramada. The agenda is at the end of this memo. Attend the meeting to find out what's going on in the 'hood. Wed. at 7:00 PM thanks to Jane & Eric Ellingson. This week's movie is Going in Style, an American heist comedy film that follows a trio of retirees who plan to rob a bank after their pensions are cancelled. A second public meeting to discuss GVR's plan for a pickleball complex on the vacant property along Esperanza Blvd will be held at noon, Thursday, February 22 at GVR East Center, 7 S Abrego Drive. Arrive early to get a seat. At the last meeting, they announced the February 22 meeting may be held at a larger venue. If the location changes, it will be posted on Nextdoor and the bulletin board at the Ramada. Join your neighbors for complimentary coffee and donuts at the Ramada on Wednesday at 8:30 AM. A nice way to start the day. Thanks to the Cookes and the Surprises for sponsoring this popular event. The Gardeners will meet at Mesquite Park on Camino Holgado for about 2 hours on Thursday starting at 9:00 AM to do a general clean up and transplant cacti. Everyone is welcome. Please bring a rake, shovel & trimming tools if you have them. Our Hospitality Committee and the Optimist Club didn't let a little rain stop them from bringing us the annual sausage fest last Friday. Grilling took place under a tent and even though the crowd was a bit smaller than usual, enthusiasm was high. Thanks to our hard working team who puts in a lot of effort to bring us great events. The Enhancement Team is looking for a few pickup owners to help pick up furniture donated to the Ramada Sale. If you can help, please call Patty Tracy at 444-4472. The Enhancement Team is looking for donations for the annual Ramada/Bake Sale on March 3. This is Enhancement's big money-raising event and they need your donations to make the sale a success. They will accept household goods, jewelry & accessories, furniture for home and garden, garage items, bicycles, computers (working or not), and working printers. They are NOT able to take TVs, clothing, mattresses or box springs, or sleeper sofas. They will pick up your items promptly. To donate items, call Patty Tracy 520-444-4472 or Patti Purcell 971-409-3511. To donate baked goods call Sandi Oster 520-625-0039, Jane Ellingson 520-625-7782 or Terry Golden 520-661-5222. To donate jewelry, call Robin Lockwood 612-618-5582 or Vera Gates 415-235-8685. Last week a resident accidentally left his car unlocked in the driveway overnight and in the morning discovered some items had been stolen. Please be aware that these episodes occur occasionally in our relatively safe neighborhood. If you see any suspicious activity, please don't hesitate to call 9-1-1. 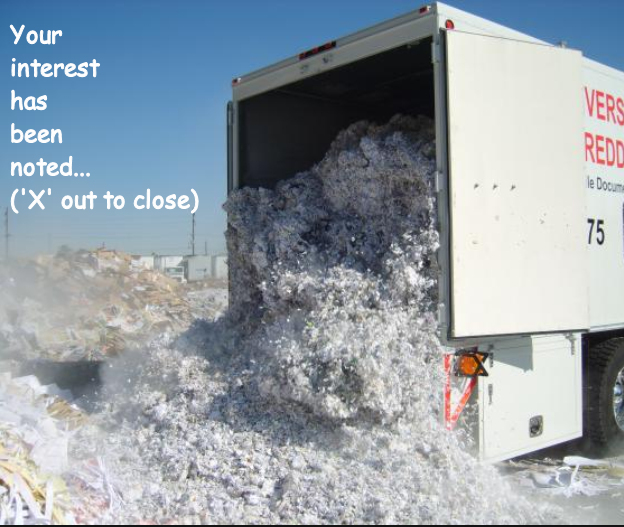 Our Enhancement Team is considering holding a paper shredding event for EE residents on the second Tuesday in April (the 10th.) Beacon Secure will be collecting documents to be shredded off-site. The team will hold the event only if enough residents are interested. To let them know about your interest in participating, click here. The MMM is published weekly and sent to Esperanza Estates residents & others upon request.